Advance Booking, Save 20% Off on Deluxe Studio Room Dorsett Shanghai, China! Advance Booking, Save 20% Off on Deluxe Studio Room Dorsett Shanghai, China. Make sure to book your stay 3 days in advance at Dorsett Shanghai, China and save 20% on deluxe studio room as well enjoy exclusive benefits of: Free buffet breakfast for one person. 20% discount on room rate at Best Available Rate. 24 hours free use of wifi and in room broadband Internet access. Terms & Conditions: Period of booking & stay: Now until 30th June 2017. Subject to 15% service charge. Enjoy 38% Off On Minimum 2 Nights Stay At Dorsett Grand Chengdu, China! Enjoy 38% Off On Minimum 2 Nights Stay At Dorsett Grand Chengdu, China. Book your stay for minimum 2 nights at Dorsett Grand Chengdu hotel in china and enjoy 38% off the best available rate on all room types. Terms & Conditions: Period of booking & stay: Now until 31st December 2016. Minimum 2 nights staying. Not applicable for group booking. 10th Anniversary. Get Choicest Of Magical Options Lan Kwai Fong Hotel, Kau U Fong, Hong Kong. Lan Kwai Fong Hotel, Kau U Fong has been through a successful 10 years and celebrating with a new look and 10 magical offers. Guests may pay additional HK$10+10% for any one choice from below. Pick any 3 options if booking for City View, Mountain View and Harbour View room; 4 options for Deluxe Rooms and 5 options for Suite rooms. Options: Lco till 10pm 1 box of Jenny Bakery Cookies. Buffet breakfast for 1 person. One bottle of house red / white wine. One piece of laundry / dry clean / pressing. In room minibar and snacks upon check in, no refill. 50 mins in room deep tissue massage � only for Deluxe or Suite Room booking. One time departure limo from hotel to Airport Express Hong Kong Station subject to availability. Take away Hong Kong popular dessert Mango Pomelo Sago from Honeymoon Dessert for 2 persons. Take away 1 bowl of Beef Brisket Noodle from world famous Kau Kee with over 90 years historyskip the queue and the packed environment. Terms & Conditions: Booking period: until 31st December 2016. Staying period: until 2nd January 2017. Minimum stay of 2 nights. Other conditions may apply, visit landing page. Enjoy Up To 15% Off On Advance Booking!! Enjoy Up To 15% Off On Advance Booking Dorsett Kwun Tong, Hong Kong. Book your stay 14 days in advance at Dorsett Kwun Tong Hotel in Hong Kong and enjoy up 15% off best available rate on all room types. Special Privileges: 24 hour Free wifi Internet. Free use of Swimming Pool. In room tea/coffee making facilities. Free use of 24 hour open Health Club. Free usage of handy smart phone, to enjoy free IDD calls selected countries, local calls & 3G mobile Internet access. Free schedule shuttle bus services to and from apm shopping mall, Tsim Sha Tsui and Kowloon Station Airport Express. Terms & Conditions: Period of booking & stay: Now until 31st December 2016. Booking require 14 days advanced purchase. Receive Up To 50% Off Best Available Rate on Super Suite! Receive Up To 50% Off Best Available Rate On Super Suite Deal Dorsett Tsuen Wan, Hong Kong. Dont wait longer, book your stay now at Dorsett Tsuen Wan Hotel in Hong Kong and enjoy up to 50% off best available rate on Suite with all Dorsett Lounge privileges. Other Privileges: Complimentary wifi internet. 20% discount for any treatment at The Spa. Complimentary admission to the Outdoor Swimming Pool & Gymnasium. Complimentary Shuttle Bus Service to/from Hotel and MTR Tsuen Wan Station. Complimentary 3G Mobile Internet Access & Unlimited IDD & Local Calls powered by �handy� smartphone. Terms & Conditions: Period of booking & stay: Now until 11th September 2016 inclusive. Hong Kong Family Fun: Enjoy 15% Off Staying!! Hong Kong Family Fun: Enjoy 15% Off Staying At Dorsett, Silka Far East Hong Kong. Welcome to the �Hong Kong Family Fun� Offer at Silka Far East, Hotel Hong Kong. With this exclusive promotion, kids will enjoy the hassle free accommodation experience. Book your stay now to receive 15% off your getaway. Exclusive offers includes: Free wifi. Free Handy Smartphone. Free Shuttle Bus Service. Free daily breakfast for child under the age of 12 max 1 pax per room per night. Terms & Conditions: Period of booking & stay: Now until 14th July 2016. The offer cannot be used in conjunction with any other offers /discounts and /or promotions. Book Now. Long Stay Package, Up To 30% Discount On Best Available Rate For 14 Days Stay!! Long Stay Package, Up To 30% Discount On Best Available Rate For 14 Days Stay Dorsett Shanghai Hotel, China. Dorsett Shanghai Hotel in China offers you a 14 Days Long Stay Package offering up to 30% discount on best available rate including some great services: Free use of wifi. Free buffet breakfast for one person. 25% off laundry & dry clean service. Terms & Conditions: Period of booking & stay: Now until 31st December 2016. Use promo code: 14DAYLS. Long Stay Deal: Save Up To 17% On Best Available Rate! Long Stay Deal: Save Up To 17% On Best Available Rate Dorsett Singapore Hotel. Book your stay for a minimum of three nights or more at Dorsett Singapore Hotel and save up to 17% off the best available rate. Terms & Conditions: Period of booking & stay: Now until 29th December 2016. Minimum stay of 3 consecutive nights is required. Blackout dates apply. This promotion cannot be used in conjunction with any other promotions, discounts and vouchers. Short Break Promotion - Enjoy Up To 20% Off Staying! Short Break Promotion - Enjoy Up To 20% Off Staying At Dorsett, Silka Far East Hotel, Hong Kong. Ready for recharge? Escape from hustle and embrace your family and friends with Short Break Promotion offering up to 20% off and other extras while staying for minimum 2 nights at Silka Far East Hotel, Hong Kong. Offer includes: Free wifi. Free mini bar. Free Shuttle Bus Service. Free Handy Smartphone. Terms & Conditions: Period of booking & stay: Now until 14th July 2016. Minimum Stay for 2 consecutive nights is required. Escape at Silka: Up To 30% Off On Room Rates! Escape at Silka: Up To 30% Off On Room Rates Dorsett, Silka Cheras, Kuala Lumpur. Enjoy a quality holiday and explore the city, book your stay now at Silka Cheras Hotel in Kuala Lumpur and save up to 30% off on room rates. Terms & Conditions: Booking period: Now until 30th June 2016. Staying period: Now until 31st December 2016. Use promo code: URBAN. All Round Year Deal: Save Up To 50% Off On Suite & Rooms!! All Round Year Deal: Save Up To 50% Off On Suite & Rooms At Dorsett Shanghai, China Hotel. Dont let this opportunity out. Book your suite or rooms at Dorsett Shanghai, China Hotel and you will enjoy exclusive benefits of: Up to 50% discount on room rate at Best Available RateBAR. Free buffet breakfast for up to 2 persons. Complimentary in room Mini Bar. Daily laundry allowance RMB50. 24 hours free use of wifi and in room broadband internet access. Free use of Club Lounge meeting room facility up to 2 hours. T&C: Valid for stay from now till December 31, 2016. Subject to 15% service charge. Discount & benefits applies on Deluxe park view suite, Loft Suite and Studio Room, Please check offers conditions while applying. Easter Package From �119 At Dorsett Shepherds Bush, London Hotel. This Easter, book your stay at Dorsett Shepherds Bush, London Hotel, price from just �119. Offer includes: Easter egg in the room on arrival. Accommodation with English breakfast. Westfield London VIP Shopping pass. T&C: Offer valid for stay from 18th March 2016 to 10th April 2016. Subject to availability. Book Now. Valentines Package From �199 At Dorset, Shepherds Bush, London. Celebrate this Valentine with Dorset , Shepherds Bush, price from �199. Couples will also receive an exclusive Valentines Day House of Fraser Westfield gift bag, with treats from Urban Decay to indulge in on the most romantic day of the year. Package includes: English breakfast. Accommodation for 2. Chocolate strawberries and rose petals on arrival. Valentines Day dinner in Pictures served on 12th, 13th & 14th February. T&C: Offer valid for stay at 12th February 2016 to 15th February 2016, subject to availability. Please leave your contact details to confirm time of arrival and Valentines dinner in Pictures. Valentines Day Room Package From HK$1,312 At Dorsett Tsuen Wan, Hong Kong Hotel. Stay a night at Deluxe Room with 2 Complimentary Semi Buffet Lunch and SPA 60 Mins at Dorsett Tsuen Wan Hotel, price from HK$1,312 Privileges: A bottle of House Red Wine. Complimentary mini bar replenished daily. Complimentary wifi Internet Access. Complimentary admission to the Gymnasium. Complimentary Shuttle Bus Services to MTR Tsuen Wan Station via MTR Tsuen Wan West Station. Two complimentary Valentines Day Semi Buffet Lunch applicable on 13 / 14 / 15 February 2016. Two complimentary Chinese Acupressure Massage or Swedish Relaxation Massage Treatments 60 Minutes at The Spa. T&C: Booking Period: valid from now till 13 February 2016 inclusive. Stay Period valid from 13 14 February 2016 inclusive. Reservation must be made at least 1 day prior to the date of arrival and subject to the room availability. Book Now. Get 20% Discount With Minimum 3 Nights Stay At Dorsett Kwun Tong Hotels Hongkong. Get 20% Discount With Minimum 3 Nights Stay At Dorsett Kwun Tong Hotels Hongkong. Make your reservation on Dorsett Kwun Tong Hotels at any room types in 2016 and you can enjoy special offer of 20% off the best available rate. Special Privileges: Free use of 24 hour open Health Club. Free use of Swimming Pool temporarily close in winter time. 24 hour free wifi Internet access. Free 2 daily buffet breakfast per room not applicable to reservation of standard room. Free schedule shuttle bus services to and from apm shopping mall, Tsim Sha Tsui and Kowloon Station Airport Express. Enjoy exclusive offer 20% off dining at La Maison de l Orient. T&C: Period of booking and stay: From 1st January 2016 to 31st December 2016. Offer is subject to a minimum of 3 consecutive nights stay. Book Now. Early Bird Promotion - Get 15% OFF!! Get 15% Off with Early Bird Promotion at Dorsett Regency Kualalumpur Malaysia. Pay less, Book Early. Plan ahead and get the Best Deals. Book at least 14 days in advance and enjoy the fabulous discount of 15% Off the Best Available Rate. Terms and Conditions: 15% off Best Available Rate. Valid for bookings and stays from now till 31st December 2015. Blackout dates applied. Booking must be made at least 14 days in advance from the arrival date. No refund and no amend policy applicable. Offer is not to be combined with other offers or promotions and subject to change without notice. Early Booking Offer - Save Up To 20% on Your Stay. Save Up To 20% on Your Stay with Early Booking Offer at Dorsett Tsuen Wan Hong Kong. Book Early & Save More. 20% discount when booking a minimum 21 days in advance. 15% discount when booking a minimum 10 days in advance. Terms and Conditions: Valid for Bookings and stays from now till 31 December 2015. Above offer is subject to the room availability. The offer cannot be used in conjunction with any other offers /discounts and /or promotions. In case of any dispute, Hotel reserves the right of final decision. Book Now. Weekend Escapade with Free Breakfast Dorsett Grand Labuan, Malaysia. Weekend Escapade with Free Breakfast Dorsett Grand Labuan, Malaysia. Escape the weekend into a world of relaxation at Dorsett Grand Labuan. Explore Labuan Island and share quality time with your loved ones in our elegant deluxe room overlooking the panoramic view of the island s breathtaking skyline. Inclusive of: Free wi fi. Accommodation of one1 night weekend stay in a Deluxe room at Dorsett Grand Labuan. Breakfast for two2 persons at Victoria s Brasserie. 10% F&B discount at all hotel s F&B Food & Beverages outlets, during stay. Terms and Conditions: The offer is valid for booking and stays until 31 December 2015. Valid only for weekend stays Friday to Sunday and Public Holidays. Advance reservation is required. Take 5% Off with Super Save Promotion. Take 5% Off with Super Save Promotion at Silka Seaview by Dorsett Hospitality Hong Kong. We offer an attractive 5% discount for as short as 1 night stay with Free Wifi and Free in town shuttle bus service. T&C: Valid for bookings and stays until 31 December 2015. Offer is subject to the room availability. The offer cannot be used in conjunction with any other offers /discounts and /or promotions. Book Now. Get 20% Discount with Minimum 3 Nights. 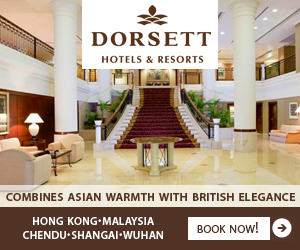 Get 20% Discount with Minimum 3 Nights at Dorsett Kwun Hotels Hongkong. From now to 31 December 2015, you can enjoy our special offer 20% off bar for all room types. Special Privileges: Free use of 24-hour open Health Club. Free use of Swimming Pool. 24-hour Free WiFi Internet access. Free 2 daily buffet breakfast per room (not applicable to reservation of standard room). In room tea/coffee making facilities. Free usage of 'handy' smart phone, to enjoy free IDD calls (selected countries), local calls & 3G mobile Internet access. Free schedule shuttle bus services to and from shopping malls (apm and MegaBox), Tsim Sha Tsui and Kowloon Station Airport Express. Enjoy exclusive offer - 20% off dining at La Maison de l' Orient. Terms and Conditions: Promotional offer is valid for bookings and stays from now to 31 December 2015. Offer is subject to a minimum of 3 consecutive nights stay. Reservation for Standard Room will be for room only. Book Now. Weekend Escapade at Dorsett Grand Labuan Malaysia. Weekend Escapade at Dorsett Grand Labuan Malaysia. Escape the weekend into a world of relaxation at Dorsett Grand Labuan. Explore Labuan Island and share quality time with your loved ones in our elegant deluxe room overlooking the panoramic view of the island s breathtaking skyline. Inclusive of: Accommodation of one1 night weekend stay in a Deluxe room at Dorsett Grand Labuan. Breakfast for two2 persons at Victoria s Brasserie. 10% F&B discount at all hotel s F&B Food & Beverages outlets, during stay. Terms and Conditions: The offer is valid until 31 December 2015. Valid only for weekend stays Friday to Sunday and Public Holidays. Advance reservation is required. Strictly subject to room availability, for dates requested at time of reservation. Early Bird Promotion at Dorsett Regency Kualalumpur, Malaysia. Early Bird Promotion at Dorsett Regency Kualalumpur, Malaysia. Pay less, Book Early. Plan ahead and get the Best Deals. Book at least 14 days in advance and enjoy the fabulous discount of 15% Off the Best Available Rate. Terms and Conditions: 15% off Best Available Rate.Valid for stay from now till 31st December 2015. Blackout dates applied. Booking must be made at least 14 days in advance from the arrival date. Minimum 3 Nights with 20% Discount Offer at Dorsett Kwun Hongkong. Minimum 3 Nights with 20% Discount Offer at Dorsett Kwun Hongkong. From now to 31 December 2015, you can enjoy our special offer - 20% off BAR for all room types. Special Privileges: Free use of 24-hour open Health Club. Free use of Swimming Pool. 24-hour Free WiFi Internet access.. Free 2 daily buffet breakfast per room (not applicable to reservation of standard room). In room tea/coffee making facilities. Free usage of 'handy' smart phone, to enjoy free IDD calls (selected countries), local calls & 3G mobile Internet access. Free schedule shuttle bus services to and from shopping malls (apm and MegaBox), Tsim Sha Tsui and Kowloon Station Airport Express. Enjoy exclusive offer - 20% off dining at La Maison de l' Orient. Terms and Conditions: Promotional offer is valid for reservations staying from now to 31 December 2015. Offer is subject to a minimum of 3 consecutive nights stay. Reservation for Standard Room will be for room only. The offer cannot be used in conjunction with other special offers and/or promotions. The rates are subject to 10% service charge per room per night. Book Now. Early Booking Offers - Save Up To 20% on Your Stay Dorsett Tsuen Wan, Hong Kong. Early Booking Offers - Save Up To 20% on Your Stay Dorsett Tsuen Wan, Hong Kong. Book Early & Save More. 20% discount when booking a minimum 21 days in advance. 15% discount when booking a minimum 10 days in advance. Terms and Conditions: Stay period valid from now till 31 December 2015. Above offer is subject to the room availability. The offer cannot be used in conjunction with any other offers /discounts and /or promotions. Book Now. Super Save Promotion 5% Off at Silka Seaview Hong Kong! Super Save Promotion 5% Off at Silka Seaview Hong Kong. We offer an attractive 5% discount for as short as 1 night stay with Free Wifi and Free in town shuttle bus service. T&C: Validity Period: Until 31 December 2015. Offer is subject to the room availability. The offer cannot be used in conjunction with any other offers /discounts and /or promotions. Book Now. Advance Purchase Dorsett Hospitality International! Advance Purchase Dorsett Hospitality International! Save 10% easily on your room rates when you book 14 days in advance. So hurry, the time is now. Terms and conditions: Bookings are to be made at least 14 days in advance. Rooms are subject to availability. Blackout dates apply. Prepayment is non-refundable, and booking is non-cancellable/non-amendable. Book Now. Early Bird Special!! Book at least 7 days in advance and enjoy 10% OFF the Best Available Rate. Booking period: Now till 31 December 2015. Stay period: Now till 31 December 2015. Advance reservation is required, confirmation is subject to availability. FREE WIFI access. Non-cancellable and non-refundable. If cancelled or no show the full price of the reservation will be charged. Book Now. Save 45% on Loft Suite! Save 45% on Loft Suite. 14-day advance purchase for Loft Suite, you will enjoy exclusive benefits of: 45% discount on room rate at Best Available Rate BAR. Free buffet breakfast for up to 2 persons. 24 hours free use of WiFi and in room broadband internet access. Free use of Club Lounge meeting room facility up to 2 hours. Complimentary in room Mini Bar. Daily laundry allowance RMB50. Valid for any stay from now till December 31, 2015. Book Now. Minimum 2 Nights Stay Offer! Minimum 2 Nights Stay Offer! Stay with us and enjoy 15% discount from Best Available Rate with minimum 2 nights stay and above. Booking period: Now till 31 December 2015. Stay period: Now till 31 December 2015. T&C: Advance reservation is required, confirmation is subject to availability. FREE WIFI access. Non-cancellable and non-refundable. If cancelled or no show the full price of the reservation will be charged. Book Early & Save! Get 10% discount when you make the reservations 3 days in advance. Package Includes: Complimentary daily buffet breakfast for one guest. Complimentary broadband access in room. Welcome fruit. 10% discount on food & beverage. Terms and Conditions: Offer is only applicable for reservations made 3 days prior to arrival. Book Now. Super Save Promotion: Get 5% Off!! Super Save Promotion: Get 5% Off Dorsett Hospitality International. We offer an attractive 5% discount for as short as 1 night stay with Free Wifi and Free in town shuttle bus service. Validity Period: Until 30 June 2015. Book Now. Get 5% OFF, Super Saver Dorsett. Get 5% OFF, Super Saver Dorsett. Applicable to all room types, our Super Saver rate ensures maximum value for even 1 staying night. Rate is inclusive of an array of thoughtful services and amenities. Terms & Conditions: 24 hour Flexi Stay is subject to hotel room situation and minimum 72 hours advance notice to hotel is required. Full prepayment, non cancellable and non refundable. Book Now. Super Weekenders Dorsett Hospitality International! Super Weekenders Dorsett Hospitality International! Take a weekend escapade by checking into Dorsett Singapore from S$160++ per night. Room comes with complimentary Wifi access and irresistible dining and spa offers. Terms and conditions: Available for stays on Friday, Saturday and Sunday. Rooms are subject to availability. Blackout dates apply. Cancellation policy is 72 hours prior to arrival local hotel time to avoid one night charge. This promotion cannot be used with any other promotions, discounts and vouchers. Shanghai Ocean Aquarium Package! An experience you will always remember at Shanghai Ocean Aquarium (SOA)! Standing next to the Oriental Pearl Tower, Pudong, a twenty thousand square metre aquarium with a collection of more than 450 species of aquatic animals from the five continents and four oceans. Take your family on this fascinating "round the world" underwater journey begins from Yangtze River! Terms and Conditions: Maximum of 3 persons including child in each room. Ramadan & Syawal Special!! Book your stay in Dorsett Grand Labuan during this Ramadan. Offer Description: Get 20% OFF Best Available Rate. Inclusive of buffet breakfast. Complimentary 1G internet access per day. Terms and Conditions: Rooms are subject to availability. The promotion rate is not valid with on-going promotions, discounts and offers. Special Ramadan Promotion! Only from RM 390.00++ per room per night. Inclusive of: Deluxe Room with WiFi. Sahur or buffet breakfast for 2 person. Buffet "Dapur-dapur Malaysia" (Dinner) for 2 person. Booking Period: Now till 28 July 2014. Stay Period: 29 June till 28 July 2014. Offer is not to be combined with other offer or promotion and subject to change without notice. Minimum 3 Nights with 20% Discount Offer!! Minimum 3 Nights with 20% Discount Offer!! From now to 31 December 2014, you can enjoy our special offer 20% off BAR for all room types. Special Privileges: Free daily morning newspaper. Free use of Health Club. Free use of Swimming Pool. 24 hour Free WiFi Internet access. Free 2 daily buffet breakfasts per room not applicable to reservation of standard room. In room tea/coffee making facilities. Free schedule shuttle bus services to and from shopping malls apm and MegaBox, Tsim Sha Tsui and Kowloon Station Airport Express. Early Bird Promotion!! Pay less, Book Early. Plan ahead and get the Best Deals. Book at least 14 days in advance and enjoy the fabulous discount of 15% OFF the Best Available Rate. Book Now. Terms and Conditions: 15% off Best Available Rate. Valid for stay from now till 31st December 2014. Blackout dates applied. Booking must be made at least 14 days in advance from the arrival date. Early Save 15% Savings with 21 Days or Above Advance Reservation!! Early Save 15% Savings with 21 Days or Above Advance Reservation!! Enjoy a fantastic 15% savings with 21 days or above advance reservation at Silka Seaview Hotel & Silka West Kowloon Hotel. Stay More & Pay Less 15% Off!! Stay More & Pay Less 15% Off!! Enjoy a fantastic 15% discount when you stay a minimum of 4 consecutive nights at Silka Seaview Hotel & Silka West Kowloon Hotel. Silka Family Getaway! School holiday is just around the corner, take this opportunity and give your children and yourself a treat this year end. Stay with us for 3 days 2 nights and pay only RM499++. This package includes: Minimum 2 nights stay in Deluxe Room with breakfast for 2 persons. Complimentary extra bed with breakfast for 1 child 12 years old and below. Welcome drink. Welcome drink. Complimentary ice cream at La Maison for 2 children. Package is valid from 5th June to 30th June 2014. Hong Kong Summer Spectacular Offer!! Hong Kong Summer Spectacular Offer!! Planning a vacation in Hong Kong? Enjoy a special 3 Day/ 2 Night package with various added facilities with Dorsett Hospitality with this special Coupon. Valid for these properties: Dorsett Tsuen Wan, Hong Kong. Dorsett Kwun Tong, Hong Kong. Lan Kwai Fong Hotel @ Kau U Fong. Silka Seaview, Hong Kong. Silka Far East, Hong Kong. Silka West Kowloon, Hong Kong. Valid for booking until August 28, 2014 and for stays from June 27 to August 31, 2014. Romance Rendezvous in Central -The Mercer!! Romance Rendezvous in Central -The Mercer!! Stay in our One Bedroom Suite with Kitchenette for a romantic night, including: A bottle of Champagne. One way limousine from hotel to The Peak / Stanley Market and Departure Limousine from hotel to Airport. Daily buffet breakfast. WIFI / Broadband internet access. Mini Bar. Romance Rendezvous in Central - Lan Kwai Fong Hotel @ Kau U Fong. Romance Rendezvous in Central - Lan Kwai Fong Hotel @ Kau U Fong. Stay at Deluxe Harbour View Room or Suite for 2 nights or more. One way limousine transfer from hotel to The Peak or Stanley Market during stay period. A bottle of red house wine with chocolate. Daily buffet breakfast. WiFi / Broadband internet access. Save 60% on Deluxe Park View Suite! Save 60% on Deluxe Park View Suite! Stay in Deluxe Park View Suite, you will enjoy exclusive benefits of: 60% discount on room rate at Best Available Rate BAR. Free buffet breakfast for up to 2 persons. 24 hours free use of WiFi and in room broadband internet access. Free use of Club Lounge meeting room facility up to 2 hours. Complimentary in room Mini Bar. Daily laundry allowance RMB50.Package price is valid until 31 December, 2014. Save 45% on Loft Suite!! Save 45% on Loft Suite!! 14 day advance purchase for Loft Suite, you will enjoy exclusive benefits of: 45% discount on room rate at Best Available Rate BAR. Free buffet breakfast for up to 2 persons. 24 hours free use of WiFi and in room broadband internet access. Free use of Club Lounge meeting room facility up to 2 hours. Complimentary in room Mini Bar. Daily laundry allowance RMB50. Package price is valid until December 31, 2014. Weekend Escapade Dorsett Grand Labuan. Weekend Escapade Dorsett Grand Labuan. Escape the weekend into a world of relaxation at Dorsett Grand Labuan. Explore Labuan Island and share quality time with your loved ones in our elegant deluxe room overlooking the panoramic view of the island s breathtaking skyline. Inclusive of: Accommodation of one1 night weekend stay in a Deluxe room at Dorsett Grand Labuan. Breakfast for two persons at Victoria s Brasserie. 10% F&B discount at all hotel s F&B Food & Beverages outlets, during stay. Terms and Conditions: The offer is valid until 31 December 2014. Valid only for weekend stays Friday to Sunday and FT Public Holidays. Advance reservation is required. Book Early & Save. Get 10% discount when you make the reservations 3 days in advance. Package Includes: Complimentary daily buffet breakfast for one guest. Complimentary broadband access in room. Welcome fruit. 10% discount on food & beverage. Terms and Conditions: Offer is only applicable for reservations made 3 days prior to arrival. Offer cannot be used in conjunction with other special offers. This offer is only valid until 25th Feb 2014. Dorsett Prosperity Deals. Book now to enjoy 18% discount from Best Available Rate for all room types which comes together with Breakfast & WiFi. Valid for stay from now till 31st December 2014. Booking period from now till 9th February 2014 only. Rooms are subject to availability. Offer is not to be combined with other offers or promotions and subject to change without notice. Stay More & Pay Less 10% Off!! Stay More & Pay Less 10% Off!! Enjoy a fantastic 10% discount when you stay a minimum of 2 consecutive nights at Silka Seaview Hotel, Silka Far East and Silka West Kowloon Hotel. Validity Period: Until 30 June 2014. Year End Promo.. Celebrate this school holiday in the city where the lights and sounds of year end festivities are bright and colourful. This is a promotion not to be missed. Package includes: 15% discount OFF Best Available Rates promotion includes welcome drink. 20% discount OFF F&B ala carte items. Surcharge of RM50++per package for booking between 15 - 31 December 2013. Package is valid from 15 December 2013 to 5 January 2014. Christmas & New Year Eve Promotion. Christmas & New Year Eve Promotion. Let s celebrate your Christmas night and New Year s Eve at a Home away home. Come to enjoy a bottle of house wine in our deluxe room with your beloved. Special Privileges: Free one bottle of house wine. Free daily morning newspaper. Free use of Health Club on 3/F. 24 hour Free WiFi Internet access. Free 2 daily breakfasts per room per day. In room tea/ coffee making facilities. Free schedule shuttle bus services to and from shopping malls apm and MegaBox, Tsim Sha Tsui and Kowloon Station Airport Express. Terms and Conditions: Promotional offer is valid for reservations staying from 21 December 2013 to 2 January 2014, inclusive. The offer cannot be used in conjunction with other special offers. Year End Special. A special room rate starting from RM238++ and indulge in our exceptional buffet breakfast to kick start your day. Room rates inclusive of breakfast for two & free WiFi. Subject to availability. Offer valid from 15th December 2013 5th January 2014. Book Now. Suite Promotion. Suite Promotion including: Buffet Breakfast. Early check in and Late check out. CNY 100 daily food & beverage voucher. One way transfer from airport to hotel. Waiver of 15% service charge. Daily soft drinks & beer. Book Now. Romance Rendezvous in Central. Stay at Deluxe Harbour View Room or Suite for 2 nights or more. One way limousine transfer from hotel to The Peak or Stanley Market during stay period. A bottle of red house wine with chocolate. Daily buffet breakfast. WiFi / Broadband internet access. Book Now. Suite Promotion. Book One Bedroom Suite at The Mercer and enjoy a complimentary transfer from hotel to airport / train station / ferry terminal. An exclusive boutique hotel with tastefully designed rooms to cater for the elite traveler, The Mercer is conveniently located in the business district of Central and Sheung Wan, served by an excellent transportation network. Stay 3 Nights or More Save 33%!! Stay 3 Nights or More Save 33%!! Embrace you with our warmest hug in this winter. Stay 3 Nights or More and Save 33% on your bookings, including: Free Breakfast. 20% Food & Beverage Discount. Book Now. Year End Special. Complete your year end celebration with shopping and culinary experiences. One night stay in Deluxe Room. Buffet dinner. Buffet Breakfast. Unlimited WiFi access. Welcome drinks. Book Now. Christmas & Year End Special. Christmas & Year End Special. Lets celebrate Christmas and New Year 2014 with us, Enjoy our 20% OFF for our Best Available Rate. The promotions inclusive of: Buffet Breakfast. Complimentary Wifi. Terms and Conditions: Valid from December 15, 2013 till January 5, 2014. Advance reservation required. Limited number of rooms available. Book Now. Pay One Night For 2 Nights Stay. Pay One Night For 2 Nights Stay. Pay One Night for 2 Nights Stay, Including: Buffet Breakfast, Free WiFi / Broadband internet access. Year End Promotion!! Week day Mon Thu at 15% discount off Best Available Rate, includes buffet breakfast for 1 person and complimentary WiFi. Weekend Fri Sun at 20% discount off Best Available Rate, includes buffet breakfast for 1 person with complimentary WiFi. Last Minutes Special Discount Offer!! Last Minutes Special Discount Offer!! You can enjoy our last minute special discount offer 15% off BAR for all room types. Special Privileges: Free daily morning newspaper. 24 hour Free WiFi Internet access. Book Now. Stay, Shop & Save Programme - Dorsett! Stay, Shop & Save Programme - Dorsett! Be the first to learn about Silka s promotion packages and special offers! Various offer: Freshness Burger. Hoi Tin Tong. Thai Pad. 3D GOLD Jewellery. Business @ Pleasure - Special Offers! Business @ Pleasure - Special Offers! The Business @ Pleasure package includes: 50 minute Chinese Traditional Body Massage per stay. WIFI / boardband Internet access. Daily buffet breakfast. Welcome fruit platter. Stay in Deluxe Room or Harbour View Suites. Romance Rendezvous in Central Offer! Romance Rendezvous in Central Offer! Including: One way limousine transfer from hotel to The Peak / Stanley Market during your stay. A bottle of house red wine with chocolate. Daily buffet breakfast. WIFI / Broadband internet access. Fantasy Holidays in Hong Kong - Dorsett! Fantasy Holidays in Hong Kong - Dorsett! Fantasy Holidays in Hong Kong including: Hong Kong Disneyland 1 Day Pass for 2 persons. WIFI / Broadband internet access. Daily buffet breakfast for 2 pax. Stay in Deluxe Room / Harbour View Suite. Cosmopolitan Hotel Dorsett Offer! Enjoy 35% discount of room rates when you stay for 7 consecutive nights. Inclusive of: Two hour limousine service. Daily laundry allowance. Discounts on various services including Internet access and breakfast. Dorsett Shanghai Offer! Enjoy 15% discount of room rates when you stay for 7 consecutive nights and 20% discount for 14 consecutive nights stay. Inclusive of: Buffet breakfast for 1 person. 24 hours free use of WiFi and in-room Internet access.